We invite you to particpate in this adventure-cultural expedition ... seakayaking across Chile till the Pacific Ocean experiencing the Patagonia channels and fjords remoteness as few people ever will. After meeting in Puerto Varas, very close to Puerto Montt airport, our trip adventure will continue navigating by boat the Ancud Gulf , drive the Northern Austral Road and start paddling downstream Palena River until the Pacific Ocean to continue south through channels , fiords and islands bordering Isla Magdalena National Park , relaxing at Puyuhuapi Hot Springs and magnifiscent views of Queulat Glacier. We assure a unique and unforgettable experience to you, gigantic cascades, deep and narrow fiords covered by the humid forest of the Patagonia, colorful creeks of fishermen, dolphins and sealions, probailities of whales and orcas, variety of sea birds, volcanoes, contact with the people that inhabit these magical places, appreciate the dawn floating in ours kayaks and the possibility of accesing places seen by very few people. The only way to access these areas is by water. We will be navigating in an area very isolated, only some pioneers living, where the weather plays a decisive role, in which the tides and winds are fundamental elements to consider. Opportunities Andes Mountains, Palena river, Melimoyu Volcanoe, hidden hot springs, Queulat Glacier , condors, fisherman villages, fantastic fjords, dolphins , sea lions, possibilities of pinguins, orcas and whales and a variety of sea birds. 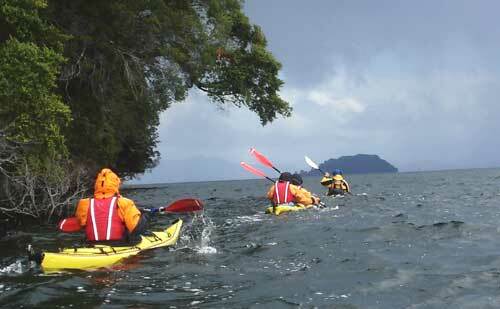 Activities sea kayak expedition downstream Palena River , Aysen channels and fjords, hotsprings, contact with authentic pioneers of this area. 2)Airplane - about 2 hours from Santiago to Puerto Montt airport. 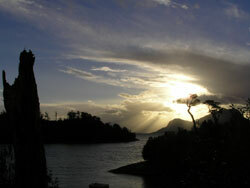 (www.lanchile.com) and a taxi to Puerto Varas (40 minutes). 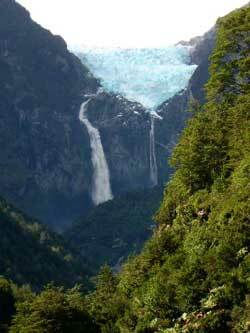 The area in Patagonia, specially once we reach the Pacific Ocean is really very variable and changes extremely fast. 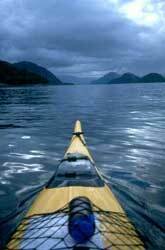 We suggest this is a trip for intermediate and experienced paddlers and campers . 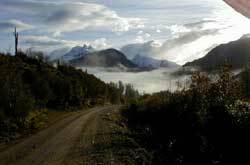 Weather in Patagonia is very variable . It rains,the sun appears, it's foggy and it's misty all in the same hour. We can expect many days of rain but also sun showing us some magic views of the surroundinds, sometimes we will be paddling in windy conditions and breaking waves , sometimes aprox.1.5mt (4.5 feet) , remote campsites , start the days very early to avoid the strong winds. Also consider that if any emergency the evacuation will be extremely- extremely slow or almost impossible , no hospitals in the area (please read the conditions section). About water tempetrature.. cold...it is very important that you come with very good gear for your legs and feet because we will have always to get out of the kayak and also get in the kayak in the water to protect the kayaks from the rocks of the shore. Please consider that this is an " exploratory trip " that means that we know part of the route but there is also a section that we havent been before , although we open this route in 2000 for seakayak trips, in this ocasion we will try to explore a different route. Because of that we have study the area with satellite photos, charts , ask information. We use the word "expedition" due to the nature you will encounter and the fact that all of the participants will share and must be prepared to confront all of the personal challenges that the the trip presents us, especially the climate. To promote safety, we will use doubles and singles kayaks imported from the USA and Germany, and before the trips starts we will have a complete safety-talk and practice some sea kayak paddling and rescue techniques in Llanquihue Lake. We will be travelling with satelite telephone and marine waterproof VHF radio. We are not offering a race...and we will "try" to complete the program of this totally self-supported expedition (no boat with us, everything will go inside the kayaks) . Will be according to the nature of a self-supported trip in a variable area (breakfast, trailfood while paddling and a warm dinner)...plus the always good surprise of the food that the locals will offer us..
At 10:00 AM we will meet in Puerto Varas. This is a small pleasant city 20 km north of Puerto Montt, situated along the shores of Llanquihue Lake, in front of Osorno volcano and 1000km south of Santiago. Here you will get to know the other members of the group and we will talk about the logistics and trip details. After lunch we will have a complete safety-talk and practice some sea kayak paddling and rescue techniques in Llanquihue Lake. Night at hostel in Puerto Varas. Day 2: Breakfast at the hostel (included) . This is the day we have to cross the Ancud Gulf in a ferry boat from Puerto Montt to Chaitén (10 hours aprox. navigating at night) . There is no road to arrive there and the only way is by the sea. Because of the limited space in the boat and high demand for the crossing , we have to be ready to get in it at any time in the afternoon ... so the morning will be free to visit the town (lunch not included). Day 3: Early in the morning after arriving in Chaitén we will continue travelling in our van towards the Andes on the Northern Austral Road until meeting Palena River , a wide and flat river of clear waters surrounded by dense rainforest ... and the beginning of our journey to the Pacific Ocean. Lunch at a family hostería in La Junta town , then the adventure starts loading our seakayaks with all the equipment and inmediately paddling downstream ideally till finding some hidden hotsprings . Campsite (B-L-D). This day we can expect to find some currents in the first section of the river (maninly if it has been raining). During this expedition we will try to camp with local colonos (ranchers) if we find some in order to learn more about the place and their particular way of living in this isolated places. Day 5: At this point Palena river meets the Pacific Ocean and is totally open and exposed to the winds (this is the most exposed stretch of the expedition) so we will use a local boat , if it is necessary , to navigate this part. 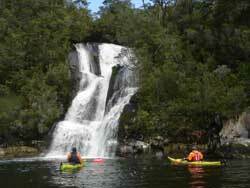 We will continue paddling throuh Canal Refugio channels until we reach the tiny village of Melimoyu. 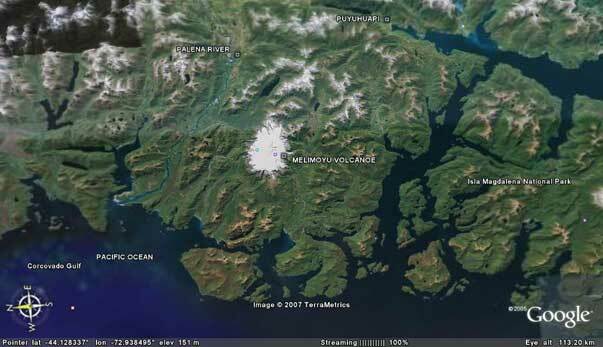 We will cross by land the Peninsula of Melimoyu using any alternative available and camp at the other side next to the fiords. (B-L-D). Day 12 (aprox): Ferry boat to Puerto Montt finally ending our adventure in our Hostel in Puerto Varas (breakfast included). NOTE: This Itinerary is an estimation and the program can be modify or cancel depending on the group and weather conditions. Authentic cultural experience with real pioneers . 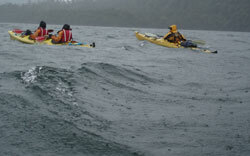 Safety-talk and practice of sea kayak rescue techniques prior to the big trip (Day 1). Transportation in our van from Puerto Varas till Puerto Montt , the navigate by ferry boat till Chaitén- continue driving to La Junta and onces the trip ends return from Puyuhuapi town to Chaitén - Ferry boat till Puerto Montt and by private vehicle to Puerto Varas. 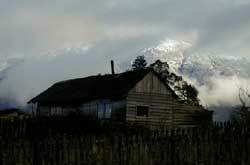 2 nights stay at Hostal in Puerto Varas , 1 night guesthouse in Chaitén town. Visit hotsprings in Palena river and Puyuhuapu channel. Navigation Equipment: sea Kayaks imported from the USA and Germany, expedition models, with original rudder, spray skirt, paddles, life jackets, paddling jackets. Cooking equipment + group tarp. 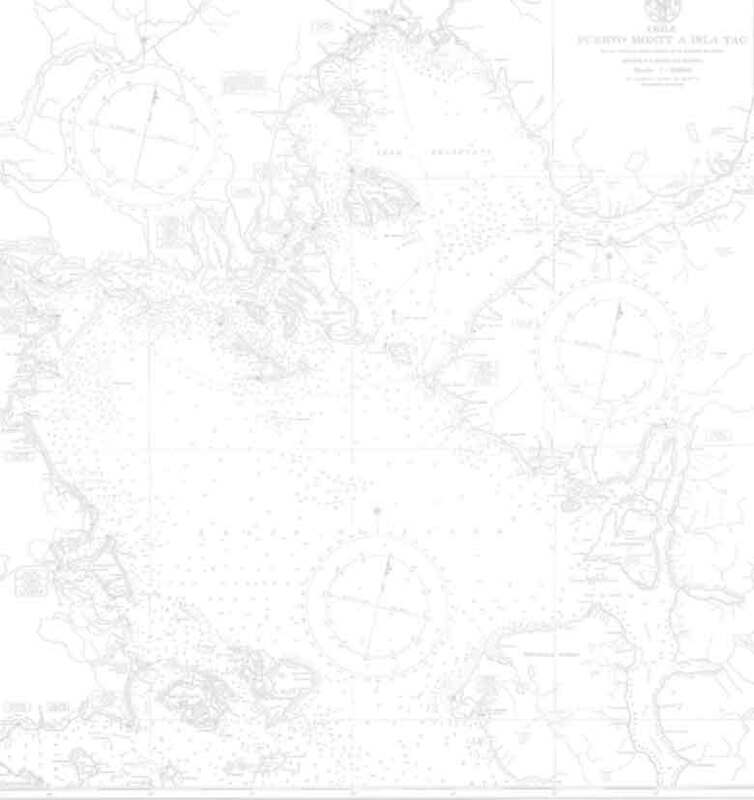 Safety Equipment: Satellite Telephone, Marine VHF Radio, tide tables, nautical charts and satellite photos. Chilean Navy navigation permit required. Bilingual Guide (English) certified by the British Canoe Union as a BCU 4 Star Sea Award , with first aid course (Wilderness First Responder Course) , sea kayak rescue knowledge and NOLS sea kayak trainning. Read carefully the program of the trip and ásk us any doubt. Understand that all activities performed in nature may involve risk. The program could be modified or cancelled at any stage due to weather conditions or sudden incidents that could affect the security of the group . Understand that evacuation from this area is extremely slow or almost impossible. To have read and have a clear understanding of the Terms and Conditions section. Send complete the RESERVATION Form and MEDICAL Form that appears after you press the RESERVATION button at the end of this program. -Everyone has to be a real active participant in every step of the trip. -Feel confortable paddling in winds of 15 - 20 knots in 1.5 m (4.5 feets) breaking an surfing waves. 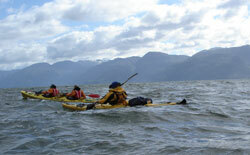 -Be confident with bracing strokes and very advisible to have ideally a wilderness first aid course. * Everyone must be ready to demonstrate before the trips starts different alternatives of self-rescue and assited rescue and we highly recommend to know how to roll a seakayak. *We will have to deal a lot with expedition behaviour and solve situations as a group requiring a lot of teambuilding and positive attitude. *Understand that this is an area where rains aprox 4 meters per year so will raina lot ...but also amazing sunny days . This is is a self-supported trip so we will have to travel with the minimum equipment so we can have space inside the kayaks for everything considering the lenght of the trip. Note: We must state that the success of this type of trips is subject to unexpected weather and personal situations, so adventurous spirit and good disposition will be fundamental. * You can obtain your fishing permit in Puerto Varas. Do you wish to accommodate this trip to you needs as a Custom Trip (private trip) ?